Blake managed to stabilize her once-precarious health; her book offers fellow food-intolerance sufferers encouragement and hope. When her body lost its ability to digest ninety-five percent of the foods most people normally eat, Sara Blake went on a quest to discover how she could nourish herself and survive. Her book, Food Intolerance, is the result of her desire to provide a resource for others who suffer from digestive disorders, and to stimulate interest on the part of scientific researchers in the function and dysfunction of the living digestive system. Unable to find the help she desperately needed from the medical establishment, Blake, who calls herself the “canary in the coal mine,” experimented on herself over the course of many years. She found that people may not only be sensitive to certain foods, but also to toxins in the foods, the way in which foods are prepared, the equipment used to prepare them, and elements commonly present in our daily environment, including those found in medicines and personal care products. These sensitivities, coupled with the lack of understanding of how the digestive system functions, can, she says, leave people who suffer from food intolerance ill, confused, and isolated – especially in a society where so much social interaction involves food. Blake devotes much of the book to discussing her own digestive issues. Her case was so severe that she, out of necessity, covers a great deal of ground—much of which may be of use to others whose cases are far less severe. She includes information on which foods are likely to aggravate digestive issues, signs that a particular food should be avoided, how-tos on preparing foods safely and using equipment properly, naturopathic versus allopathic understandings and treatments of digestive issues, and the characteristics of different types of foods and drinks and their effects on health. She also includes many recipes that she has found helpful through the years. A requisite medical disclaimer is included, and the detailed table of contents and index make locating information easy. The interior layout and design are user-friendly and attractive. However, the cover art, while lively and colorful, is cluttered and distracts from the book’s title and author’s name. A brief biography is provided, though additional information regarding Blake’s background might help to bolster her authority. It is impossible to discount what Blake has to say about her personal research and its impact on her life, but her book would benefit from clarifications regarding what information comes from her, and what is backed by recognized authorities. The inclusion of footnotes would be beneficial. Statements such as “the majority of commercially-grown produce has not been treated with pesticide (organic or not)” warrant citations, as does her praise of chlorine in tap water. 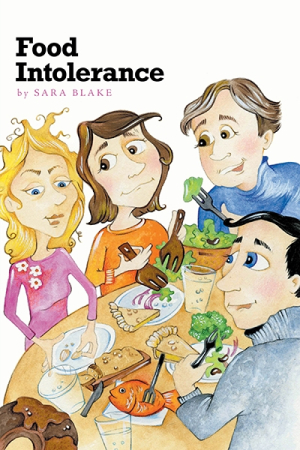 Through her own meticulous research, Blake managed to stabilize her once-precarious health; her book offers fellow food-intolerance sufferers encouragement and hope that they can do the same.